While the maintenance of some vehicle components can wait until you have some extra money to spare, the brakes should never be neglected. The brakes are what allow you to stop at railroad crossings, slow down on the freeway when traffic gets backed up and prevent you from rear-ending the car in front of you in a parking lot. The ability to stop quickly and safely is a vital component of overall automobile safety. 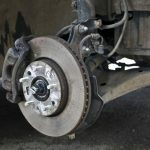 If the brakes start slipping, squealing or otherwise malfunctioning, they require immediate inspection and possible repair to lessen the risk of an accident down the road. Pushing on the brake pedal applies force to the brake fluid in the master cylinder of the braking system when you need to stop the car. The fluid travels through a pathway of tubes and hoses to the wheels of the car. The fluid then presses against metal calipers that exert pressure on the piston. This piston transfers that force over to the brake pads that create friction against the disc rotor, slowing the vehicle’s motion. It is vital that no air be in the brake system or else you’ll start to feel more give in the brake pedal than usual and the car will be slower to come to a complete stop. Always check the calipers when examining the brakes. If they are rusted or corroded, they can’t slide as well as they should when the brake pedal is suppressed and this reduces the car’s ability to stop. Rusted calipers require sanding to remove the rust or they need full replacement in cases of heavy corrosion. Only use the proper brake fluid in your car to help prevent brake failure. Your automotive manual should tell you what type of brake fluid the car needs and this instruction should always be followed to prevent the risk of brake damage. Leaks are another common brake problem since they let air into the system while also allowing fluid to escape. Any hoses or connections that leak brake fluid need replacement as soon as possible and the brake fluid requires topping off afterward. Squeaking brakes could be the result of moisture in the system or an early indicator that the pads are wearing thin. Thin pads mean the car won’t stop as efficiently, putting you at greater risk the longer you drive the car without repair. They prevent the appropriate amount of friction from building up, preventing the car from stopping as efficiently as it should. If you have anti-lock brakes on your car, avoid pumping them when coming to a stop. Anti-lock systems rapidly pump the brakes themselves by design, resulting in a pedal vibration you’ll likely feel when the system activates. Pumping the brake yourself disrupts this process and can damage your brakes. It also makes it harder to stop if you have an anti-lock system. Press down on anti-lock brakes firmly and consistently to bring the car to a stop in the most effective and efficient way possible. A well-maintained brake system not only protects your car, it also protects your family, pets, personal belongings and anyone else sharing the road with you. Treat your brakes well and they’ll perform at their best when you need them most.